Government of Punjab has announced 226 New Jobs in Nishtar Hospital Multan published in Daily Express Newspaper dated 24/03/2018. 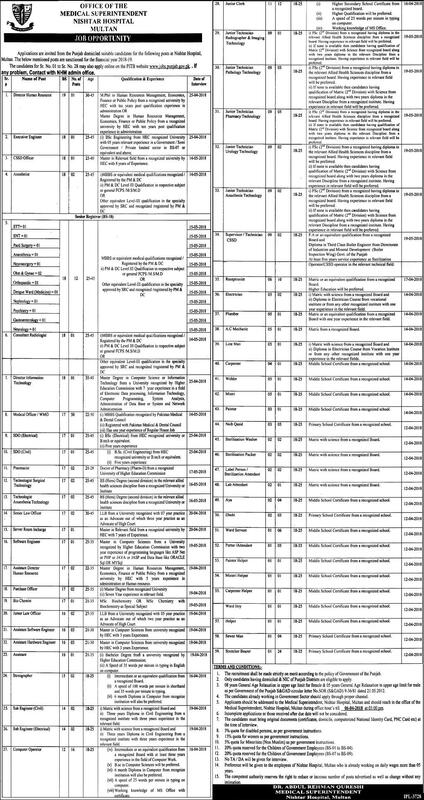 Candidates who have required Qualification and Experience may apply for Medical/Hospital Jobs in Punjab 2018 for the title of Deputy Director HR, Executive Engineer, CSSD Officer, Anesthetist, Consultant Radiologist, Director Information Technology, Medical Officer, SDO, Pharmacist, Technologists, Senior Law Officer, Server Room Incharge, Software Engineer, Assistant Director, Purchase Officer, Bio Chemist, Junior Law Officer, Assistant Software Engineer, Assistant Hardware Engineer, Assistant, Stenographer, Computer Operator and many others Jobs. For Serial No 1-28 Candidate may also apply for www.jobs.punjab.gov.pk Preference Shall be given to candidates who are working in Nishtar Hospital Multan since 05Year on Daily Wages.